Hir, a dark comedy by multi-award winning playwright Taylor Mac, debuted only a year ago in New York to much acclaim. This January, Capital T Theatre is bringing the play to Austin for the first time. The play is, in broad terms, an installment in the long pantheon of American family dramas; the four person cast includes a father, a mother, and their two children, and much of the drama revolves around their dysfunctional relationships. But Hir is definitely a modern take on that long-lived dramatic genre. It's more of a black comedy than a straight drama, and its characters include a father who's barely able to communicate (in a very literal sense, due to a recent stroke) and who dresses like a clown, a mother who is struggling to assert her dominance after years of oppression, a son who's returning from war while also recovering from drug addiction and a daughter who is transitioning from female to male. "It doesn't sound very funny when you say all those things," admits producer Mark Pickell, "But the play is a really funny show." "[It's] funny and kind of introspective as well about who we are as Americans," Pickell says. "Where does the white male fit into this new society and why are they struggling so much to identify with all these new changes with our demographics and gender politics and things like that?" 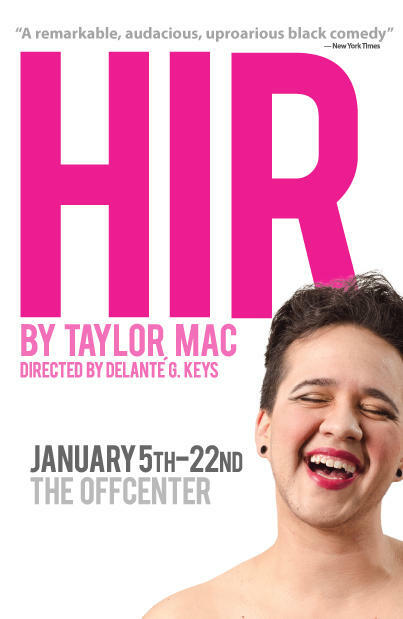 'Hir' runs January 5 - 22 at the Off Center. 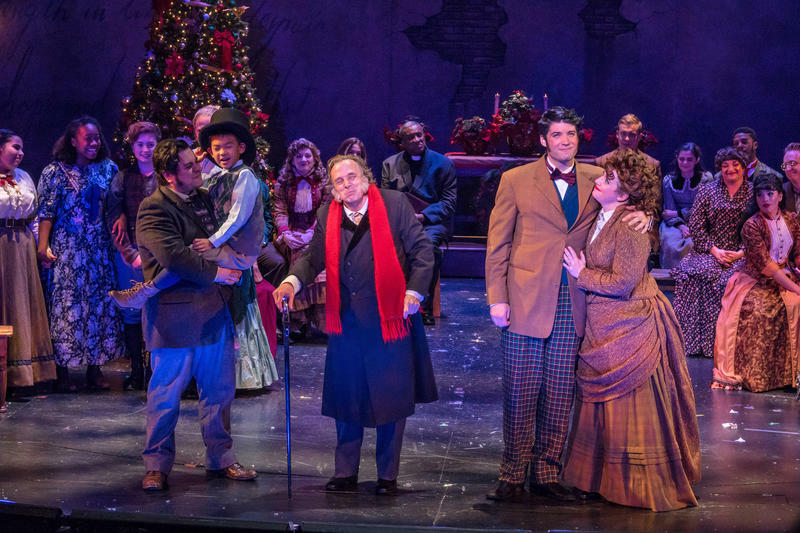 In only its third year, Zach Theatre's annual production of A Christmas Carol is already becoming a holiday tradition, for both audience and cast members. "I love it," says actress Kelly Petlin. "I tell [director] Dave [Steakley] 'I'll do this until you tell me you tell me I can't do it anymore.'" For actor Michael Valentine, the cast and crew of A Christmas Carol have become something of a surrogate family. "I'm not from Texas, but this is my third holiday season here," he says. "And I've always felt so embraced by this community." When the Blue Genie Art Bazaar opened for the first time in 2001, founding member Dana Younger didn't realize the art show and sale would take over his holiday season for the next fifteen years (and counting). "Yeah, it's amazing that this is our sixteenth year, but it's a neat thing about traditions" he says. "And it's not just a tradition to us and the artists, but it's a tradition to the community, too." 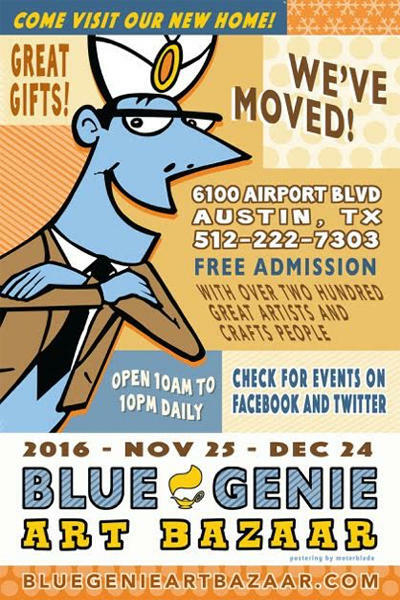 Once a fairly small showing of arts and crafts created by the members of Blue Genie Art Industries, the bazaar has grown to include works by some 200 local and regional artists, and it's now open daily from the day after Thanksgiving through Christmas Eve. For Younger, the bazaar has become synonymous with the holiday season.. 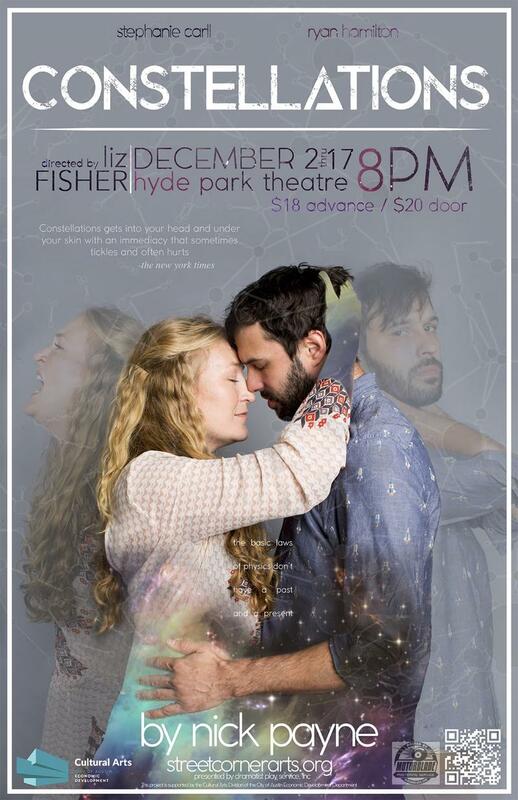 This month, Street Corner Arts is presenting Constellations, the award-winning play by Nick Payne. It's a love story, featuring only two characters, but with an important twist: we see dozens of alternate universe versions of these characters, playing out their relationship in myriad possible ways. "The playwright assumes that... multiverses are real, so what he's done is take these pivotal moments in these two character's lives and allow us to see different variations on that moment," says director Liz Fisher. "Sometimes they get together, sometimes they don't, sometimes things are going great, sometimes things go poorly."